I've ever owned -- even over the commercial jobbies of mine. It's my main banjo now. 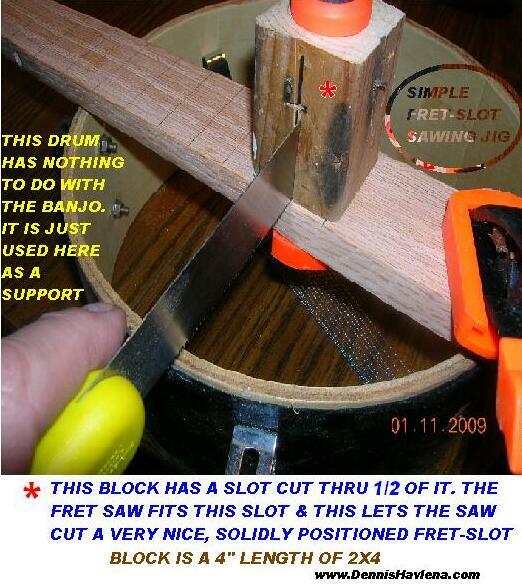 First of all, click here & build the fretless banjo mentioned in the first paragraph. A word about the mysteries of fretting instruments. neck before plotting where the frets-slots should go. might use the simple jig I built that made the job easy. become very obvious -- usually just requiring a slight tap to settle things. but if so desired - just add more. There are many fret-calculators on the web. to better accomodate the fret-spacing I used.